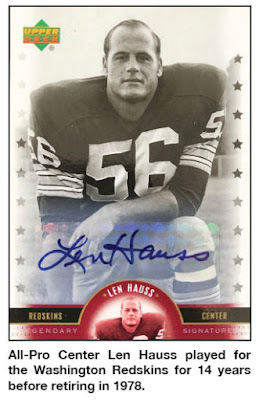 Len Hauss, you have made your hometown proud over and over. And for me to stand here to help the Board of Education and the Wayne County Touchdown Club honor you is, indeed, an honor for me, too. The connections of our families have been intertwined for almost 70 years. In the 1950s, your mother, Ida, sold insurance for NeSmith Funeral Home. As a teenager, Len, you worked there, too. I remember your mother telling about your playing football in the yard with a bunch of your boyhood friends. One of those boys was Gordon Elliott. Shortly after that sandlot game, Gordon got mysteriously ill. She worried that you, Len, and the other boys might get sick, too. As a Cub Scout, I visited Gordon as he lay dying in his iron lung. We didn’t know much about polio in those days. But I remember the nervous tone of Mrs. Hauss’ voice as she told the story. Somehow, Len, I’ve always felt you played hard not only for yourself but for others, including your friend Gordon Elliott. Len, you and Janis were in my mother’s youth department at First Baptist Church. Decades later, your sister, Lenelle, taught Sunday school with Mother. And then there was that Sunday in May, 1957. Len, I stood behind you. You waded into the baptismal pool first. I was next. As a 9-year-old, I remember thinking, “Can Brother Jenkins lift Len up after he dunks him in that water?” Len, the Lord helped our slender preacher, because the Rev. Jenkins did lift you up. 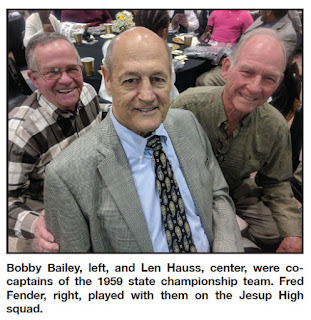 Two years later, I was in the stands—on Dec. 11—as Len and the Yellow Jackets beat Rossville, 35-7, for the 1959 AA state football championship. So many people in this room tonight have Len Hauss stories, too. Here’s one that I dial up every time I parallel park. But what’s that got to do with Len Hauss and football? 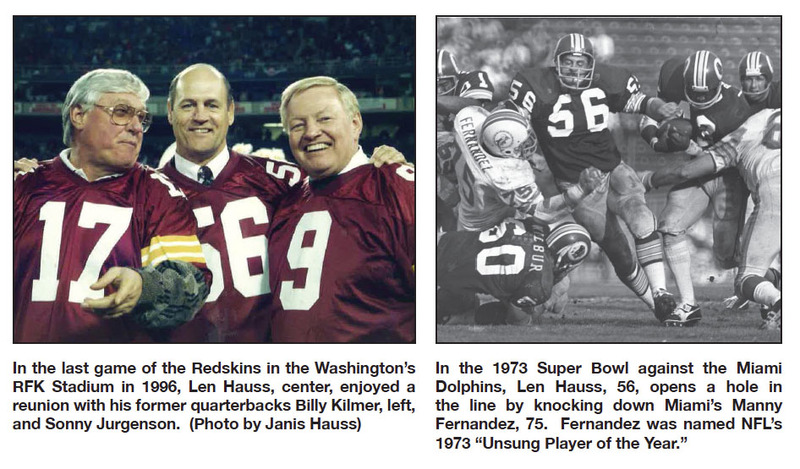 In his early days with the Washington Redskins, Len worked in the off-season. 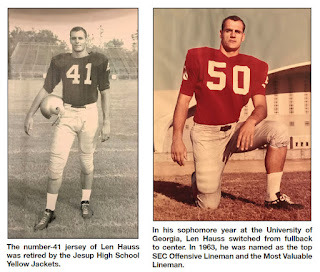 In the spring of 1965, Len did his practice teaching at Jesup High School. I was a student in his drivers’ education class. Len laid a telephone pole down and put a metal trash can at either end. Pointing to the pole, he said, “That’s the curb, and those two cans are cars.” With that setup, he taught me to parallel park. And every time I have to park that way, I imagine Len sitting beside me in that 1965 white Chevy, reminding me what to do. That’s what this part of the program is about tonight—thanking Len Hauss for his contributions on and off the gridiron. For the Jesup Yellow Jackets, Len played both ways as an All-American fullback and linebacker. Even at a young age—with his strength and grit—he was a man among boys. Over the years, I’ve met many 75-year-old men who had the misfortune of lining up against Len during high school. They can still taste the gridiron dirt from when Len ran over them. Last week, I visited with 97-year-old Charley Trippi, arguably the greatest Georgia Bulldog ever. He was on Coach Wally Butts’ staff when Len went to the University of Georgia. All these years later, Charley still effuses praise on Lenny Hauss. And Charley has enjoyed teasing Lenny about the fact that he was the one who encouraged Coach Butts to switch the bruising fullback to center. Len, Charley sent this letter to you. He congratulates your success on the football field and in life. Last week, I also visited with retired Bulldog coach Vince Dooley, who said, “Man, I wish Len had come along when I was there. What a tremendous help he would have been to our team!” Coach Dooley sends this letter. There’s a letter here from Bulldog Coach Kirby Smart. He’d like to have a Len Hauss today, too. No doubt, Len would have helped keep those Texas Longhorns off Georgia’s quarterback Jake Fromm in the Sugar Bowl. Just hours ago, Georgia inaugurated its 83rd governor. In one of Brian Kemp’s first official actions, he signed this letter. Len, Gov. Kemp joins all of us in thanking you for the positive impact you have made on so many lives. There’s a letter from Bill Curry, too, who told me last month that you, Len, were his role model as an NFL center. He wanted to be as good as you. Bill snapped the ball to quarterback legends Bart Starr of the Green Bay Packers and Johnny Unitas of the Baltimore Colts. 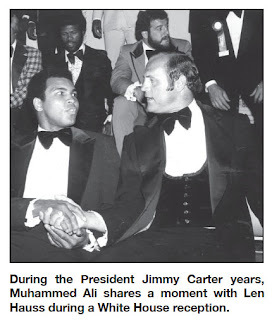 Just as Len was, Bill was president of the NFL Players’ Association. Again Bill said that you, Len, were his role model. Loran added that Len and Janis are a great team. Long before Silicon Valley introduced us the amazing answer source, Google, Dr. Lanier Harrell was my personal “Google.” Today, he is still my go-to person for answers. That’s why I reached out to Doc recently. He confirmed a story that I had heard more than 50 years ago. During Len’s first camp, Washington coach Bill McPeak lined up the rookie—one on one—with the team’s tough guy, middle linebacker Sam Huff. Huff put it on Hauss the first time. The second time, it was a draw. And the third time, Len put it on Sam. After that, Len and the future NFL Hall of Fame tackling machine bonded as friends. For 14 years, Len Hauss was a “hoss” of a lineman, retiring as team captain and an All-Pro center. In fact, Len was captain of the Jesup Yellow Jackets, the Georgia Bulldogs and the Washington Redskins. How many of you remember when NFL players were introduced on TV before games? Len Hauss would trot out and say, “I’m Len Hauss from Jesup, Georgia, and I catch more redbreasts than anyone in the NFL.” If you know Len well, you know he is an All-Pro fisherman, too. Tonight, we honor one of the greatest athletes our hometown has ever produced. Not only did he lead our high school to its last state football championship, but he inspired several generations to want to become Yellow Jackets, too. Some of us had marginal talent—and I’m speaking for myself—but we just had to wear a gold helmet, too. 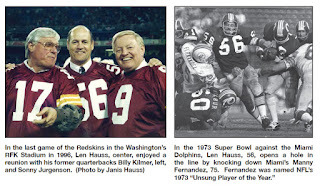 Len Hauss was our hero, and he still is. *John Donaldson was head coach. I can hear him barking, “Hubba, hubba!” right now. And I am reminded of his warning, “When you get happy, you get beat.” Amen to that! 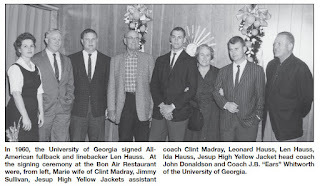 And JD played with Charley Trippi in what Coach Wally Butts called his greatest Bulldog backfield ever. His style of coaching helped a legion of young Yellow Jackets discover they had guts and a backbone under their sweaty shoulder pads. *And another key contributor to the championship is here with us tonight—Len Hauss. With pride, we have followed his high school, college and professional careers. He energized every team with a quiet, give-it-your-all style of leadership. Len Hauss has inspired his hometown, too. It is a fitting tribute that Jaycee Stadium’s gridiron be called the Donaldson-Madray-Hauss Field. God bless you, Len Hauss. Wayne County loves you. On behalf on the Board of Education, the Wayne County Touchdown Club and Yellow Jacket football players—especially the 1959 championship team—and fans everywhere, and in memory of John Donaldson and Clint Madray, I ask you to join me in giving our honoree, Len Hauss, a standing ovation.